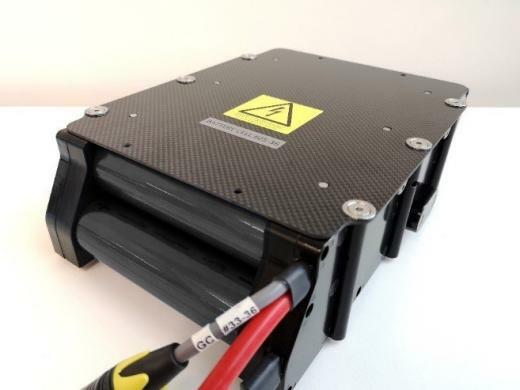 Our GST MK2 contains six identical high-power lithium ion battery packs giving outstanding power to weight ratio and giving a total capacity of 3.6kWh. This not only allows for extended testing throughout the day in tough testing environments, but also provides the necessary power to propel the GST to speeds in excess of 100km/h. These battery packs are all certified under the UN38.3 battery transportation safety testing requirement, having passed an extensive set of tests including withstanding extreme temperatures, simulated altitude testing as well as shock and vibration to 200Hz at 8g. The batteries and cells are charge cycled over 50 times to ensure electrical safety and the integrity and temperature is monitored constantly during charging and in operation. The GST has been designed for all day use on a single charge but it is equipped with an on-board charge monitoring and charger socket, allowing the GST battery to be quickly topped up at the side of the track without the need to remove the soft car body or disassemble the platform. Together the high capacity battery and proven design ensures that the GST provides maximum performance in a safe and reliable way. We are currently accepting orders for delivery late summer 2019 – contact us today for further details.